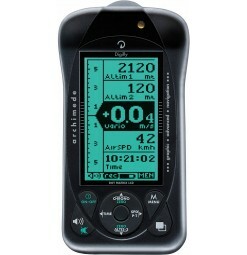 The Digifly Archimede is a completely new instrument with 2 display screens. In a lightweight, impact resistant case (metal inside), the result is a great looking, feature packed, sensitive vario, ata very keen price. An excellent choice for your first vario! By buying this product you can collect up to 23 loyalty points. Your cart will total 23 points that can be converted into a voucher of 5 €. 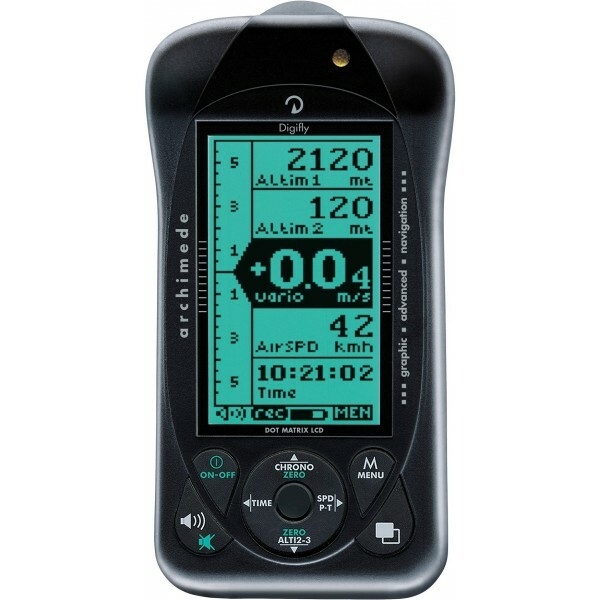 A new model for 2008, the Digifly Archimede replaces the Digifly Flyer2. The Archimede is a completely new instrument with new high resistant case (metal inside) and a multi-layer paint finish. The result is a great looking, feature packed, sensitive vario, at a very keen price, an excellent choice for your first vario. The Archimede buttons are clearly labeled, so users new to Digifly will quickly feel at home navigating the setup menus and the two main display screens on this new vario. The large, clear LCD screen also makes for easy observation in flight and the new high power audio on the front panel means that pilots will have no difficulties hearing the loud vario tones. The Archimede has a unique graphic altimeter, a live plot of your height against time, which scrolls as you fly and shows how effectively you are climbing in a thermal. It is especially useful in weak conditions. Battery life on the Archimede is excellent at over 200 hours on a single AA battery and there is sufficient memory to record flight data from your last 50 flights. PC connectivity via the optional Digifly USB PC cable allows the download of your flight data to your PC for later analysis. The Archimede software can also be updated via the optional USB PC cable allowing you to keep your flight instrument right up to date with the latest software improvements from Digifly. There is also extra peace of mind with an extended 3 year warranty.